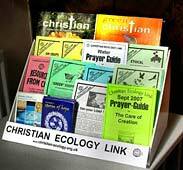 Why not make a New Year Resolution to display some of CEL's leaflets at your church? “You are the light of the world. A city on a hill cannot be hidden. Instead, they put it on its stand, and it gives light to everyone in the house. Last year saw many extreme weather events – floods across the whole Sahel region of Africa, severe drought in Australia, typhoons (16 of them) hitting China and causing extensive flooding, drought again in Southern Europe and California causing devastating fires, and severe floods in both Bangladesh and Mexico. Climatologists predicted that rising global temperatures would lead to such events . A year ago Margaret Beckett, when Foreign Secretary asked: “What makes wars start? Fights over water (as in Darfur ). Changing patterns of rainfall. Fights over food production and land use. There are few greater potential threats to peace and security.” If she had gone further and asked: “What leads to fights over water, food and land use?” she might have considered the factor we don't want to talk about – namely pressure of growing populations on mainly static supplies of food, water and land. When growing populations aspire to the consumerist society of the West, what should be our attitude? There is no way we can dissuade them from seeking the materialistic lifestyle that beckons to them from every television set. Yet the same constraints apply to all of us – diminishing water supplies, falling food production accentuated by the demand for biofuels and ever more intensive energy use. Technology can help to relieve some of the pressures, but perhaps we all need to aspire to what Richard Foster calls “The Freedom of Simplicity”. “Live Simply That Others May Simply Live” may be a timely guideline after the excesses (for some) of the festive season. It may also free us to become our true selves. According to a report called “Livestock's Long Shadow” from the UN Food & Agriculture Organisation, livestock production produces more greenhouse gases than all the world's transport systems. It is a factor in 70% of the Amazon deforestation. It is responsible for 64% of the ammonia which produces acid rain. It is also a major source of land and water degradation. And yet, with increased prosperity, people are consuming more meat and dairy products every year. Global meat production is expected to rise from 229 million tonnes in 1999/2001 to 465 million tonnes in 2050, while milk output is set to climb from 580 to 1043 million tonnes. Livestock production provides a livelihood for 1.3 billion people and contributes about 40% to global agricultural output, but the environmental cost is huge. The livestock sector accounts for 9% of CO 2 derived from human activity, but produces a much larger share of even more harmful greenhouse gases. It generates 65% of human-related nitrous oxide, which is 296 times more harmful than CO 2 , most of which comes from manure. It accounts for 37% of human-related methane emissions, which are 23 times more harmful than CO 2 . Livestock now uses 30% of the world's land surface, mostly permanent pasture but including 33% of the world's arable land now used for feeding livestock. 70% of cleared forests in the Amazon have been turned over to grazing. Livestock rearing causes major damage to water resources through pollution, eutrophication and the degeneration of coral reefs. The main polluting agents are animal wastes, antibiotics, hormones, chemicals from tanneries, fertilisers and the pesticides used to spray feed crops. Livestock now forms about 20% of all the world's animal biomass, leading to huge losses in biodiversity. 15 of 24 important ecosystem services are in decline due to livestock production.  Water: improved efficiency of irrigation systems, including full-cost pricing for water together with taxes to discourage livestock concentration close to cities. Loving Father, we acknowledge our responsibility in the degradation of so much of the world's land and water resources. In our pursuit of ever higher standards of living, we have neither recognised nor acknowledged the need to take no more from the earth than the earth can bear. As we seek to remedy the damage we have caused, save us from over-reliance on our own cleverness in applying short-term solutions. Rather, help us to use our God-given powers of reason and to seek your guidance as we meet the challenges of the New Year. In the Tabasco province of southern Mexico at least 800,000 people have been left homeless after the worst floods in 50 years. With 80% of the province under water, local churches set up shelters where relief items of food, medical materials and clean water are taken to the refugees. Pray for the communities of Tabasco who have lost everything and for the staff of Tear Fund partner AMEXTRA as they struggle to get help to the most vulnerable communities. 6.7 million people have been affected by the devastating Cyclone Sidr which struck Bangladesh in November, submerging nearly 70% of western Bangladesh under floodwaters. Trained volunteers from Tear Fund partner HEED helped remove to safety hundreds of thousands of people just before the cyclone struck, but more than 240,000 livestock were killed and over 1.6 million acres of crops destroyed. As with other disasters, it is too easy for the West to forget the long-term effects on the communities affected. Please pray for the aid agencies who are responding with limited capacity in the face of such immense devastation, and for those who are co-ordinating relief efforts. In Somalia , according to the UN Food & Agriculture Organisation, by August the number of people needing humanitarian aid had reached 1.5 million. Drought last year and floods this year have been compounded by conflict between warring parties. The FAO estimates that more than 490,000 people face food shortages and lack of earnings as floods and conflict continue. Pray for the protection of aid agency staff as they work through local groups to help communities which are in desperate need. The World Food Programme reports that before the next harvest in Zimbabwe more than 4 million people will be affected by food shortages if food aid amounting to over $3 million dollars is not made available. Only one-third of the needed wheat harvest has been produced and the Government has failed to provide the currency to pay for foreign wheat stored in Mozambique . Now the Supreme Court has ruled that the Government may seize immediately agricultural equipment from white-owned farms. Meanwhile, water shortages are affecting many people in Bulawayo and the south.. One aid worker with a 15-month old baby was only able to get water for 30 minutes every 8 days. Tear Fund partners are working with communities to provide access to a proper toilet and clean water within 500 metres of their homes. Pray for the people of Zimbabwe as they endure the worsening situation, and for the aid agencies working in the most difficult circumstances. Canada claims that it has 175 billion barrels of recoverable oil in the Alberta tar sands, making it second only to Saudi Arabia in proved oil riches, and sparking an oil rush by American, Chinese and British investors, including our own BP (formerly dubbed “Beyond Petroleum”). The problem is that tar sands are a heavy mixture of sand, clay and bitumen and the oil requires up to 5 times more energy to extract than conventional oil. According to the World Resources Institute, CO 2 emissions per year from tar sands mining will by 2020 exceed the emissions currently produced by all Britain's motor vehicles. To extract the tar sands, steam heated by gas is to be pumped into vertical wells to liquefy the tar sands and draw them to the surface – so causing less damage than current open-cast mining. Licenses to extract 350 million cu. metres of water a year from the Athabasca River have been granted by the Alberta Government. The water, contaminated with tailings from the mines, is finally stored in tailings ponds covering up to 20 square miles and a source of pollution for ever. No wonder the Canadian government has refused to meet its commitments under Kyoto , or to enter into further commitments on climate.  Climate mitigation measures must conform to sustainable principles in order to avoid, for example, the use of unsustainable sources of biofuels, such as palm oil. The city of Berkeley in California has become the world's first city to offer 20-year low interest loans to enable its citizens to install solar panels, the loans being paid back through taxes. The cost of installation – between $15,000 and $20,000 – is paid back over two decades, ensuring that each householder pays back each month no more than the solar panels would save them in electricity bills. Many US cities have expressed interest in the scheme. The Bangladeshi company Grameen Shakti was one of the four recipients of last year's Right Livelihood Awards. It has installed more than 110,000 solar home systems in rural Bangladesh , covering 30,000 villages, and shown that solar energy applications can be scaled up massively and rapidly to provide affordable and climate-friendly energy options for the rural poor. Each system consists of a 30-100 watt photovoltaic panel connected to a battery for storage. With 1500 field staff, 1000 trained engineers and 1000 local technicians, more than 4000 solar home systems are being installed each month. In addition, 4 wind energy plants, 1000 biogas plants and 3 solar thermal projects have been installed, and 9 solar-powered computer training centres have been created. The biogas programme is linked to the emerging poultry and livestock industry, with a focus on market slurry as a replacement for chemical fertiliser. Where Bangladesh leads – may other countries follow? A report called “The Amazon's Vicious Cycles”, commissioned by WWF and launched at Bali last month, shows that current trends in agriculture and livestock expansion, as well as fire, drought and logging, could clear or severely damage 55% of the Amazon rainforest by 2030. Deforestation could release between 55.5 and 96.9 billion tons of CO 2 from 2007 to 2030, amounting to more than two years of total global greenhouse gas emissions. In addition, the destruction of the Amazon would do away with one of the key stabilisers of the global climate system. WWF is promoting solutions such as minimising the negative impacts from cattle ranching and infrastructure projects, and rapidly expanding the network of protected areas. CoolEarth and other organisations are buying up vulnerable rainforest as it becomes available. President Jagdeo of Guyana has offered to place the country's entire 50 million hectares of rainforest under the control of a British-led international body in return for a bilateral deal that will enable the country to change to a green economy. Frank Field of Cool Earth is among those urging the Government to accept the offer. Sir Nicholas Stern has again emphasised that tackling the destruction of forests is one of the cheapest and most effective ways of reducing global CO 2 emissions. Loving Father, help us to change. To undertake the journey without understanding the destination. The art of gentle revolution Amen. A report called “How Green is Your Money?” commissioned by Triodos Bank and written by Professor Alex Gardner finds that when it comes to choosing where to save, most ethical consumers don't live up to their principles. “While they regularly recycle and are happy to pay more for ethical products, they ignore their basic values when it comes to their banking choices. Instead, green consumers deposit their money with banks they recognise as having policies that can harm the planet.” Despite recognising that saving green can make positive change, participants in the study blamed a lack of services, inadequate information and apathy for their decision not to do it. “Inadequate information” might suggest the difficulty of assessing the “green-ness” of industrial giants which alone have the financial muscle to put large-scale investment, for example, into renewable energy. Perhaps we should lobby more intensively companies which are able to invest in the long-term future of our planet, but choose instead to invest in polluting activities which can only worsen our predicament. The Billion Tree Campaign was launched by Nobel Peace Prize winner Wangari Maathai just over a year ago. Last month Achim Steiner, head of UNEP, was able to announce to world leaders at the Bali summit that the billionth tree had already been planted, but the campaign goes on. The Conservatives last month launched a £300 million plan which would guarantee, by means of feed-in tariffs, a fixed price for electricity generated from decentralised, low-carbon sources such as wind turbines, photovoltaic panels, combined heat and power, biomass, waste and micro-hydro. Every householder, small business, school and hospital would be enabled to generate electricity through micro-generation and sell any surplus to the local grid, so giving everyone a direct interest in saving energy. Smart meters, given free, would enable householders who install DIY energy equipment to measure their electricity consumption. The £300 million required would come from the auction of permits under the EU Emissions Trading Scheme. Meanwhile the Government has announced a plan to build 33 gigawatts of offshore wind energy by 2020 – enough to power every home in Britain . This will require about 7,000 turbines. The financing of the projects, as for new nuclear power stations, is expected to come from the private sector. It remains to be seen whether the private sector is willing to commit the necessary funds. This year the EU member states have to submit applications for a new carbon allowance under the Emissions Trading Scheme, but so far they have all submitted applications for a carbon ration equal to, or above, what they expect their emissions levels to be. The Czechs applied for 102 million tonnes of CO 2 permits for 2008-2010 even though, on current evidence, they will only need around 82 million tonnes. The Commission looks likely to grant them 86 million tonnes – an excess of 4 million over current emission levels. If other EU states behave similarly, and the EU Commission remains indifferent to meeting carbon reduction targets, it only remains for the public to voice their disgust at such irresponsibility.  To promote harmony with nature rather than slavery to consumption and endless growth. Operation Noah is an inclusive group of committed Christians from across Britain with a London-based office. They welcome people of all faiths and none. Campaign inspirations, ideas and actions, climate change news and briefings are posted on the website daily. Under the EU Waste Electrical & Electronic Equipment Regulations (WEEE) which came into force a year ago, all retailers are obliged to take back old equipment on a like for like basis and safely dispose of it. However, under the Government's Distributor Take Back Scheme (DTS) retailers can instead pay the Government a contribution to the DTS which will be used to establish WEEE collecting points throughout the country. Some retailers have not signed up to the DTS, so these are obliged to take back old goods when you replace them with new. Lord Jesus, champion of justice and righteousness, all that you made from nothing in creation seems to be falling apart in the hands of human greed and ambition. Where you shout for justice, only corruption seems to win the day. We abuse the world you have given us by pollution and waste. Our planet is changing. The ice melts, the crops fail, the floods come and we go on as usual. We are content to live with the luxury of our prosperity – achieved often because of unfair trade agreements which give others no chance to rise above their poverty. We run our taps without a thought for those who walk miles for a bucket of water. We enjoy our electronic homes in comfort without a thought for those whose home is the street or a shack. We enjoy our centrally-heated, air-conditioned lives with no thought for those whose lives have been destroyed by floods or earthquakes. Lord Jesus, you came to make us different, to transform us into people who love to act justly, who are excited by opportunities to show your love and who are humble enough to acknowledge that without you we can do nothing. Lord Jesus, as part of God's people we ask you to receive into our hearts your love for us, and so to go out into the world as your ambassadors. Empower us to be part of the miracle that changes human lives – the miracle that can herald the coming of your Kingdom. Forgive us and change us. Enable us and use us. An inquiry into pollution from shipping, commissioned by the UN International Maritime Organisation, is expected to report an increase of 50% in numbers of container ships, tankers and bulk carriers within the next five years. Reduce, Re-use and Re-cycle – in that order. The Ganges delta, which is divided between India and Bangladesh , is particularly vulnerable. A 2007 UNESCO report “Case Studies on Climate Change & World Heritage” states that a 45 cm. rise in sea levels combined with other forms of anthropogenic stress on the Sundarbans could lead to the destruction of 75% of its mangroves. Governments are often willing to tackle instantaneous disasters such as floods and earthquakes. Slow-onset disasters are another matter and call for international action on a vast scale.  There is little evidence that retailers share the benefits of promotions with farmers, and much evidence that farmers bear the costs.  Avoid arbitrary changes and terminations to contracts without considered notice.